Our 8 hour tour usually includes Hawaiian cultural sites, beautiful sightseeing, delicious food. Our beautiful Circle Island adventure on this guided, small-group tour from Honolulu. Stop at Diamond Head, the world-famous icon of Hawaii; beautiful Hanauma Bay, a pristine marine ecosystem; Halona Cove Beach, famous for its appearance in the 1953 movie ‘From Here to Eternity’ and much more. Also, check out one of the most beautiful panoramic views in the world, the breathtaking Pali Lookout and the historic Waimea Valley, featuring a botanical garden and waterfall. Honolulu hotel pickup and drop-off are included. Our beautiful day start from all the hotels in Waikiki. Hanauma Bay Nature Preserve:One of the most spectacular natural resources in Hawaii came to life over 32,000 years ago. These volcanic eruptions formed a crater on the sea floor, and waves from the ocean eventually filled the circular bay. Halona Blow Hole: A natural occurrence formed by molten lava tubes from volcanic eruptions thousands of years ago. On windy days when the tide is high, the ocean breeze sends the waves rolling on to the shore where the rock formation then shoots sea spray high into the air through the cave acting like a geyser. Waimanalo Bay: Waimānalo beach with an overall length of nearly 5.5 mi (8.9 km), with turquoise blue waters and miles of some of the softest white sand your will toes will ever touch! the longest stretch sandy shoreline on Oʻahu and you will see beautiful Koolau mountain range. 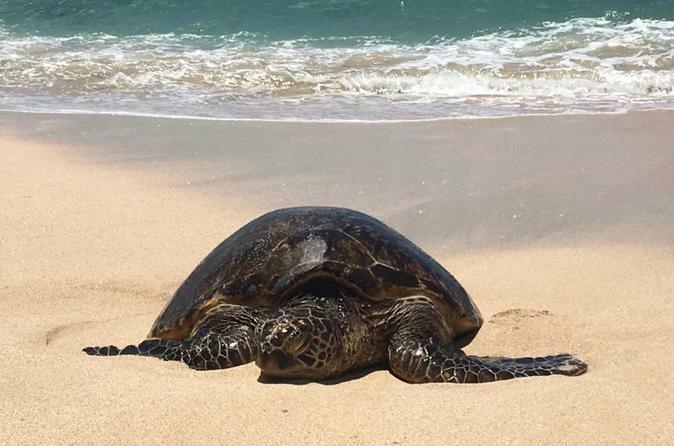 Turtle beach :Hawaiian green sea turtles come to few beaches in Oahu for take a lest and sleeping. Please do not bother them if you find sea turtles on the beach or in the Ocean. We also have surfing and turtle photography tour in winter with professional surf photographer. North Shore Beaches:North Shore Oahu is surfing capital in the world. World class wave comes in winter. We also have surfing and turtle photography tour in winter with professional surf photographer. Pipeline, Waimeia Bay, Sunset Beach, Rock point and Haleiwa town. Our last stop is the historic Dole Plantation:Dole Plantation provides enjoyable activities for the entire family, including the Pineapple Express Train Tour, the Plantation Garden Tour, and the Pineapple Garden Maze. Also popular are informational displays and presentations, as well as our plantation country store offering a wide variety of Dole Plantation gifts, local favorites, foods and refreshments including the world-famous DoleWhip®. And, before you leave you can purchase fresh pineapple to take home.